In the January 2010 edition of “People Extra” (I’m not a subscriber. My mom is. It was just lying there. Honest. ), there is an article titled “100 easy ways to change your life.” Since I’d love to have a different life, I picked it up out of curiosity… just to see how “easy” changing my life would be. The article was divided into sections. “2 ways to save money.” “4 ways to relive stress instantly.” Stuff I already knew but I my life didn’t feel any different. Then I got to “3 ways to create a soothing space.” All right. I’m stressed all the time. How can I create my own Zen environment? 1. Soften your lighting. Use accent lamps with bulbs 60 watts or lower; it’s more soothing. My bedside lamp is already at 60 watts because I ran out of 3-way bulbs last time it blew. And I can’t see a damn thing when it’s on. 2. Bring in flowers. Lavender and gardenia add calm. I’m sure I’ll feel less stressed when I’m sneezing my head off. 3. Make your bed. Coming home to crumpled sheets is so not relaxing! … You’re kidding, right? I never make my bed. The only time it’s ever made is when I change my sheets. I don’t see the point in giving up a few precious moments of sleep in order to get up and tug the sheets back into place, making it smooth and perfect even though I won’t see it again until bed time. To me, an unmade bed just invites you to hop back in and burrow under the covers. My pillows are in the perfect spot. The rumpled blankets feel more snuggly than neatly made-up ones. 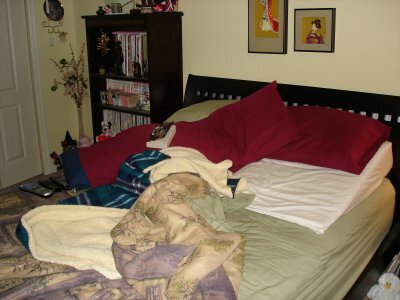 And since no one ever sees my bed but me (and occasionally the dog), I don’t feel an overwhelming urge to keep it tidy. My bed also serves as a hidy hole for various things. My TV/DVD/cable box remotes are under one pillow. Whatever book I’m reading goes under another (unless it’s something massive like Twilight … and honestly, the idea of sleeping with the Twilight book makes me feel all skeevy inside). My 25-year-old Care Bear is in there too. Yes, I still sleep with it. No, I’m not ashamed to admit it. I always feel a bit uncomfortable for the first couple of nights after I’ve changed the sheets, because everything is so stiff. And not in the good way. Walking into my bedroom at bedtime, my unmade bed invites me in, letting me know my day is finally over. So I’m sorry, Kahi Lee, design expert on the Style Network’s “What I Hate About Me,” who offered up the tips on how to create a soothing space. My bed, in all its rumpled glory, is my soothing space. However, if you would like to come over to help me feng shui the rest of my room, I’ll make my bed just for you.